Russian jurist and author; born at Berdychev March 25, 1837. His parents, who were well-to-do people, gave him a good education, and during his-early training in the ḥeder he displayed remarkable ability. Entering the rabbinical school at Jitomir, he proved himself a very apt student; and as a senior he wrote a defense of the school, the modern policy of which had been attacked by the Orthodox party. This first literary production of Morgulis was sent to the Ministry of Public Education. Graduating in 1861, he wished to enter the university, but having been educated in a government school, he was obliged to become a government rabbi. Thanks to the powerful support of Pirogov, who saw much promise in Morgulis, he was enabled after three years to enter the University of Kiev. In 1864 he registered for the law course, and while still in the university published occasional articles ("Zadiki-Chudotvortzy," "Drevnyaya i Novaya Kaballa," etc.). In 1867 he published a collection of his more important articles, such as "Frank i Frankisty," "Ocherk Ugolovnavo Sudoproizvodstva u Drevnikh Yevreyev," and in 1869 presented his thesis "O Pravye Naslyedovaniya po Moiseyevui Talmudicheskomu Zakonodatelstvu." In the same year Morgulis moved to Odessa and at once took an active part in the communal life of that city. Among the organizations with which he has been connected are the Society for the Promotion of Culture, the Agricultural Fund, the Palestinian Society, and the Rabbinical Commission. No important communal affair is disposed of without his advice; and he is considered an authority on legal matters concerning the Jews of Russia. For the last twenty-seven years he has been at the head of the Jewish industrial school Tzud; and it was due to his efforts that a model farm for educational purposes was established in connection with the Odessa orphan asylum. Morgulis occupies a prominent position among the jurists of Odessa. He was for a long time secretary of the local lawyers' organization. 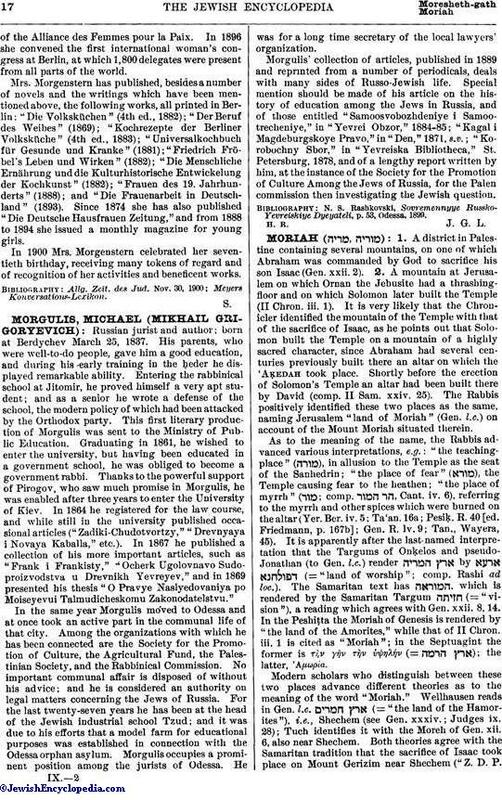 Morgulis' collection of articles, published in 1889 and reprinted from a number of periodicals, deals with many sides of Russo-Jewish life. Special mention should be made of his article on the history of education among the Jews in Russia, and of those entitled "Samoosvobozhdeniye i Samootrecheniye," in "Yevrei Obzor," 1884-85; "Kagal i Magdeburgskoye Pravo," in "Den," 1871, s.v. ; "Korobochny Sbor," in "Yevreiska Bibliotheca," St. Petersburg, 1878, and of a lengthy report written by him, at the instance of the Society for the Promotion of Culture Among the Jews of Russia, for the Palen commission then investigating the Jewish question. N. S. Rashkovski, Sovremennyye Russko-Yevreiskiye Dyeyateli, p. 53, Odessa, 1899.